Learn to Hoop Dance with Mama Ruby! Buy Now for 30% off! Regularly $99! Are you curious about hoop dance, but have no idea where to begin? Do you think hula hoop dance looks beautiful and fun, but you feel intimidated because your body doesn't look like the hoopers you've seen? Do you struggle to find an exercise routine that you can not only stick to, but actually inspires you? Do you want to get the best possible foundation for your hoop journey, instead of combing through Youtube tutorials? Do you like to exercise and learn in the privacy of your own home, at your own pace? Learn how you want, when you want. Whether you want to learn from the privacy of your own living room, or take your device with you to the park, this course is designed for you to enjoy anywhere, anytime. Get all future updates FREE! Mama Ruby has been teaching hoop dance for 6 years. She has become known globally within the industry as a strong advocate for body positivity and self love through hoop dance. Her slogan "I Hoop For Me" sums up the core idea within her teachings- that your hoop journey belongs to you, and that you have the right to enjoy the life changing experience of hula hooping, no matter who you are. Introduction to on-body foundation hula hooping including waist, hips and legs, as well as getting our feet wet with some off-body tricks. Also learn helpful stretches and how to prepare to become a hula hoop superstar. Learn chest hooping, shoulder hooping, breaks and paddles, and then we take a break from on-body hooping to learn some more off-body moves as well. Start discussing the concept of flow and how moves work together to create a seamless dance. Delving further into off body moves including isolations, palm spins, and escalators as well as variations of moves we've already learned. More on flow and tying it all together including horizontal and vertical plane concepts. Begin working on more technical moves including vortexes, four petal flowers, ghosting isolation techniques and and explore how to incorporate these into flow. Start exploring dance concepts including what to do with your free hand and some foot work. Rolls, folds and tosses! Learn techniques for rolling the hoop across your chest, back, and more. Also explore the concept of folds and tosses and how they make great transition tools for flow. Learn a choreographed hoop flow to gain a deeper understanding of how we chain moves together so you can flow naturally. Explore more ideas for transitions as your own unique, beautiful flow begins to emerge! I'm ready to love my body in a whole new way. I've been big my whole life. I know how it feels to see smaller women dancing or playing sports and wondering if I could even do it at all with my heavy legs and wide hips. Before I found hoop dance, I struggled. I lived a mostly sedentary lifestyle, working in an office and struggling to stick to a gym routine. I always wanted to lose weight but could never seem to stick to a plan. My blood pressure was on the rise and I was tired all the time. I didn't know what to do. I felt like a prisoner in my own body. Hooping changed all of that for me. I became addicted immediately to the keen sense of accomplishment I felt every time I learned a new move. That drove me to practice every day. No more bargaining with myself to try to stick to a routine. No more feeling like a failure every time I skipped the gym. I started breaking a sweat every day without even meaning to - I just loved hooping that much. Before long, I noticed my body felt and looked much more toned. My flexibility and coordination vastly improved. I had energy brimming out of me. I lost weight easily. I started recording my hoop sessions. I found myself admiring how I looked for the first time. I couldn't believe those were my hips, my arms moving with so much elegance. I decided I was going to continue to always hoop for me even if I never shared it with anyone else. But it quickly became such a powerful catalyst for so many good changes in my life, that I have spent the past six years sharing the magic with as many people as possible. 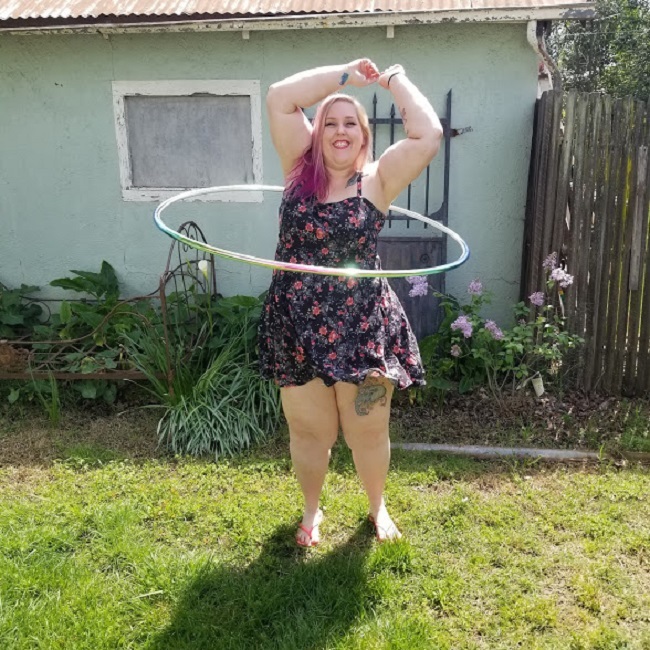 I decided to teach hula hoop dance because I want it to be more accessible to everyone, no matter who you are. My Six Week Beginner Hula Hoop Challenge is designed to help you cultivate a deep respect for your body. This is a form of exercise that will inspire you like nothing you have experienced before. Hooping is a lifestyle. It's a way to escape from the world and do something good for ourselves. To play like children again, escape from the stress of life and find our center. And that is why I will never, ever stop hooping. If I can do it, you definitely can. And I'll be there with you every step of the way! When you choose Ruby Hooping to guide you on your journey, you get a priceless gift: a beautiful, close-knit tribe of strong people who uplift each other and share skills. 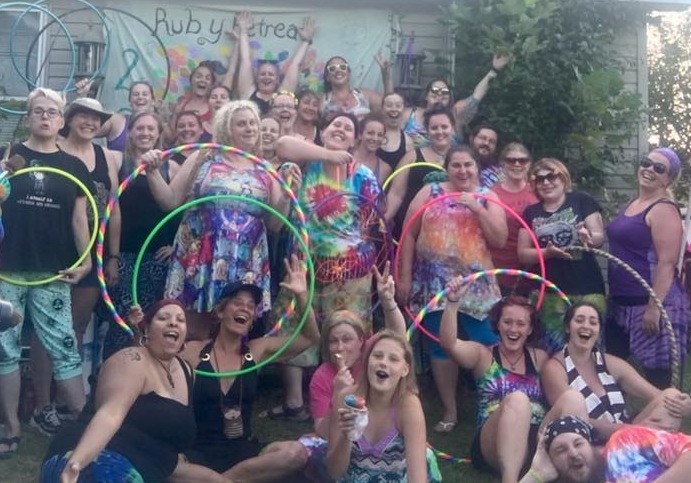 You will be invited to join our Facebook group, Ruby Hoopers, which has over 2,500 active and helpful members. We also hold an annual Ruby Retreat, a transformative weekend where we skill share and make new best friends. It literally does not matter how old you are, how big or small you are, or whether you have ever hula hooped before. Modern hoop dance is beautifully adaptable to all people! I'm ready to be a hooper! Hula hoops come in all sizes, just like people.